The American manufacturer has recently launched the new generation Endeavour just ahead of the 2016 Auto Expo. This robust SUV directly rivals with Chevrolet Trailblazer, Toyota Fortuner and Hyundai Santa Fe. Unlike the forebears, this latest version is sporty and modern. Ford has released it in six variants, which come with two diesel engine options. 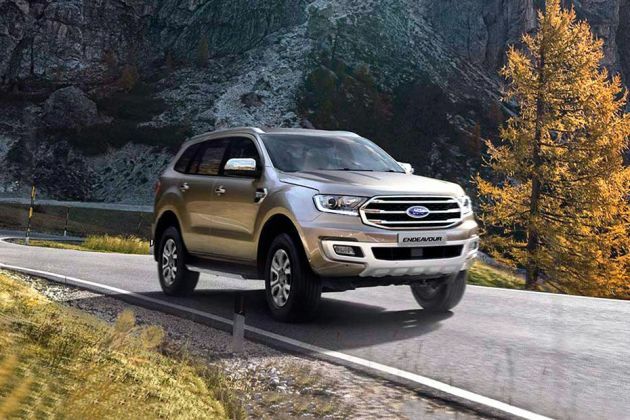 Among them, the Ford Endeavour 3.2 Titanium AT 4X4 is a top of the range variant that is loaded with many compelling features that guarantee a promising drive. Let's know more about the specs and features of this model, which is priced at Rs. 28.7 lakh. 1. Bestowed with features like terrain management system and semi auto parallel park assistance, which makes the drive more powerful. 2. Higher ground clearance enables you to take on rough terrains without any damage to its underbody. 1. Slightly rigid gear box makes driving a bit troublesome. 2. The cabin has got poor plastic materials which degrades the cosmetic purpose of the design. 1. This high end variant comes with an electric panoramic sun roof that adds a luxury touch. Ford has released the new Endeavour series with a fresh and inviting design. This recent entry looks stylish with several design accents and hi-tech features, which makes it a qualifying utility vehicle. Ford Endeavour 3.2 Titanium AT 4X4 is a high end variant in this series that gets a 3.2l diesel engine. Its exteriors are indeed dapper and refined. Ford has left its old boxy model design and has given it many curves, which makes it look better than before. This 7 seater has sufficient cabin space that gives ample comfort to its occupants. Besides these, it has some sophisticated elements like terrain management system and infotainment with SYNC 2 voice activation. Safety in this powerful SUV is also good with dual air bags, traction controls and many more. Ford has modified its boxy structure and added many stylish curves as well as creases. The trapezoidal chrome accentuated grille and stretch back headlights with LED daytime running lamps gives a sporty and powerful look to the face. The blue logo inscribed on the chrome grille is stylish. Besides, the all new bumper and square shaped fog lamps highlight the appearance in its frontage. The side profile has an inclined roof-line and bulged wheel arches that give a muscular look to this SUV. These come fitted with a set of 18 inch alloy wheels that have 265/60 R18 sized tubeless tyres. Meanwhile, the wraparound LED tail lamp cluster with chrome accents are an attraction in its rear end. The spoiler above the large windscreen adds to its sportiness, whereas the thick chrome strip on the tailgate improves its look further. The interiors of this top end variant are fresh and eye catching. From the dashboard to seats, everything inside this machine is refined and upscale. Its advanced instrument cluster comes with two TFT screens on either side of the analogue meters and displays various notifications regarding the drive. This titanium model is incorporated with front bucket seats, while the second and third row seats can be folded down to make more space for additional luggage. The driver's seat additionally gets an eight way power adjustment facility that allows you to position yourself accordingly. For the best in-car entertainment, it features an advanced infotainment system with SYNC 2 voice activation function. This comes with a TFT touchscreen and supports Bluetooth connectivity as well. You will find a few switches placed on the steering wheels, which makes it easy to operate this unit. As for the space, the cabin is huge and its occupants are ensured with abundant leg room and head room which is a boon for long drives. Special mention to the electric panoramic sunroof that lets you to feel the warm sunlight and cool air as well. Other amenities you will find inside include an illuminated and lockable glove box, dual zone air conditioning unit with automatic climate control, power windows with one touch up/down and anti pinch function, power outlet, front center armrest with storage and many others in the list. This vehicle is powered by a 3.2-litre diesel engine that gets a 6-speed automatic transmission gear box with 4x4 drive type. It carries four cylinders, 16 valves and integrated with a common rail direct injection system. This mill has a displacement capacity of 3198cc and produces a peak power of 197.2bhp at 3000rpm besides delivering a maximum torque of 470Nm between 1750-2500rpm. In terms of mileage, it returns around 7.7 kmpl within the city and 10.91 kmpl on the highways, which is low compared to its rivals. The engine is still noisy despite being incorporated with active noise cancellation system. Driving this machine will certainly leave you with a good impression. It gets an efficient suspension system that comprises of an independent coil spring with anti-roll bar on front axle and the rear one is assembled with watts linkage type. This helps the vehicle to take on any craggy pitches that comes in the way. Another focal element is its 800mm water wading capacity and 225mm high ground clearance. The handling characteristic of this muscular SUV is rather satisfactory. Besides, it is offered with a power steering that helps you to steer through the streets effortlessly even on narrow roads. Even though there is a slight body roll, it delivers an impressive ride quality. Also, it comes with terrain management system with 3 driving modes: Sand, Rock and Snow/Mud that enables adaptable driving in varied terrains. This high end variant provides utmost security to the passengers by incorporating various aspects. Some of the key features in it include volumetric burglar alarm, emergency assistance, seat belt pretensioner as well as ABS with EBD. It gets dual front, side, curtain as well as driver knee airbag that minimizes the risk of injury. Apart from these, it also comes with engine immobilizer, traction control and hill decent control thus, promising better safety to the travellers. Ford Endeavour is available in 5 different colours - Diffused Silver, Diamond White, Moondust Silver, Sunset Red, Absolute Black.